A person who lays bricks. The trade of bricklaying is a manual skill that has been acquired traditionally by serving a period of apprenticeship until qualified. A manufactured man-made masonry unit typically of a small enough size to be held and laid by one hand. Traditionally formed from plastic clay and then subjected to heat in a kiln. Modern bricks can be of other materials and solid or hollow. An indentation in the bottom surface of a brick. Looking at the underside of a brick showing the indentation in the bottom known as a frog. 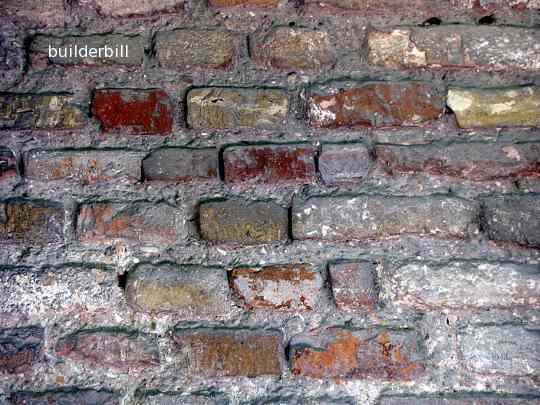 Brick-makers and brickies have been making and laying bricks for centuries. There are many fine old buildings that are still here today due to the knowledge and skill of those old tradesmen. Above is a photo of some extruded raw clay bricks drying out in a brickyard in Vietnam. When they are deemed dry enough they will be loaded in a kiln and fired. The finished bricks will be a bright orange colour. 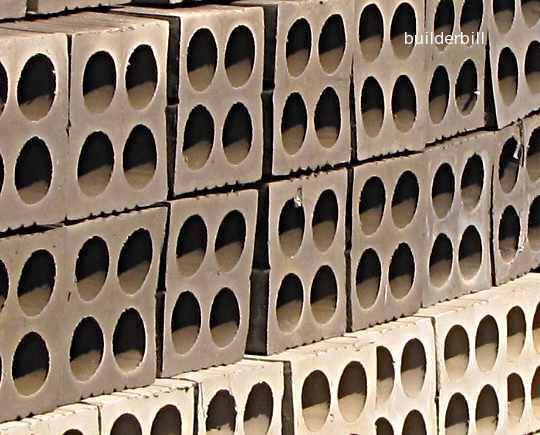 Traditional bricks are made with clay that is shaped in moulds and then fired in a kiln. The action of heating clay to high temperatures changes the chemical composition of clay into a whole new durable material. It becomes a ceramic, and depending on many factors of which the firing temperature is the most important, the bricks can be fairly soft and crumbly to intensely hard and durable. 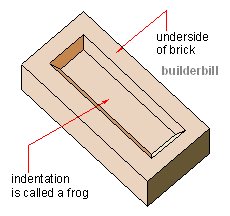 At the right is a sketch showing a frog in the bottom of a brick. these are used to help the brick to stay in position while the mortar is setting. The name is said to come from the indention in a horses hoof that resembles a frog (amphibian). They are fairly optional, with many manufacturers not using them. Above is some extra-fine brick work with small and very neat joints made with white cement in the mortar. The bricks are laid in Flemish bond. Seen in London UK. 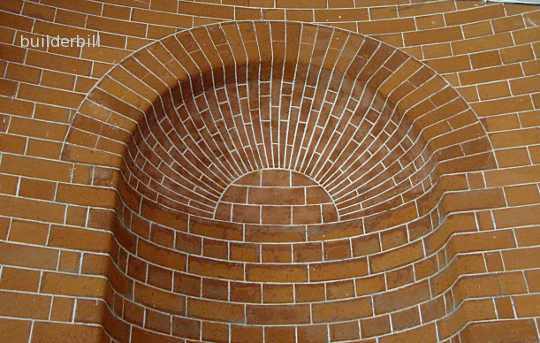 Note that the Flemish bond continues into the curved section, the shape of the brick changes but the bond remains consistent. The brick work above is as "rough as guts" and shows the wide variety in brickwork in general. This particular wall could easily be 1500 years old. Quite possibly, looking at the condition of the bricks, theycould have been recycled from an even older building. Part of an early Christian Byzantine Basilica in Ravvena.